Pearl of Golden-Hill Casablanca "Gésa"
HD-A and the ED: 0/0. Fly Over the Golden-Hill Du Bois de la Rayére "Sorel"
Judge: Alberto Cuccillato (IT) Thank you very much! Thank you Andrea and Krisztina the grooming and Adriána Németh the beautiful handling! 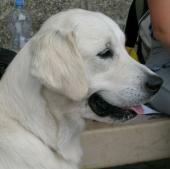 Pearl Of Golden-Hill Winter Memories for Rumba "Nina"
excellent, only 9 months old. Pearl Of Golden-Hill Winter Fire "Gino" excellent 2. Super weekend we spent with our friends in Austria, Tulln. "Very masculean head, dark eyes, good strong bone, need feat, lovely reach of neck, level top line, well bend stifles, superbly balanced outline, moved with plenty of drive, Expertly handled." JCAC, Best Junior JBOB, and the group 8 JBOG 3. Thank you very much Krisztina Süli, Sorel beautiful handled! 15.09.2011. Super news, Sorel results! Thanks for all the help Krisztina Süli! We had a fantastic weekend in the Netherlands on the Euro-dogshow,where our kennel represented by 2 of our dogs and a dog bred by us. Fly Over the Golden-Hill Du Bois de la Rayere "Sorel" junior class - excellent 3. Thank you for this photo Kriszti and Gabor! 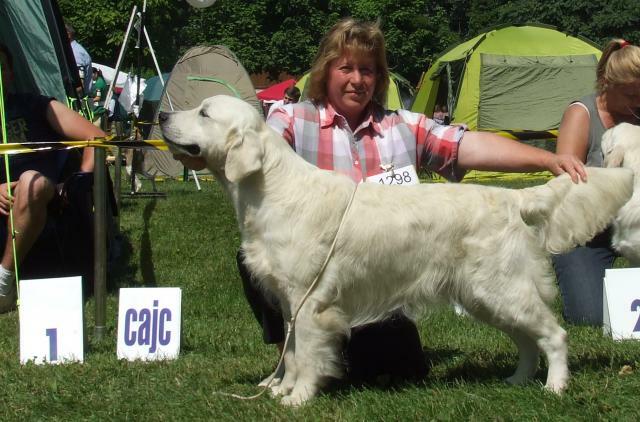 Pearl Of Golden-Hill Winter Fire "Gino" puppy class - Promissing 2. res.Eu.puppy winner! Congratulations Kata and Andris, very nice result! Pearl of Golden-Hill Winter Memories for Rumba "Nina" puppy class - Promissing 3. 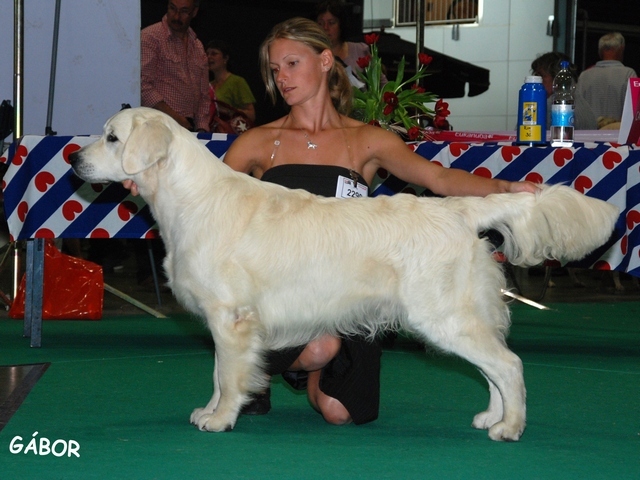 I would like to say thank you Krisztina Süli,too,for her help in my dog's handling and thanks to Ancsa and Marci,because they prepare perfectly Nina for this show. Thank you for this very nice result! Thank you for this photo Zsolt Grégász! Congratulations Marika and Noémi, this is very good result! Thank you Adriána Németh the excellent handling, and Edit Mezőfi very good photos. 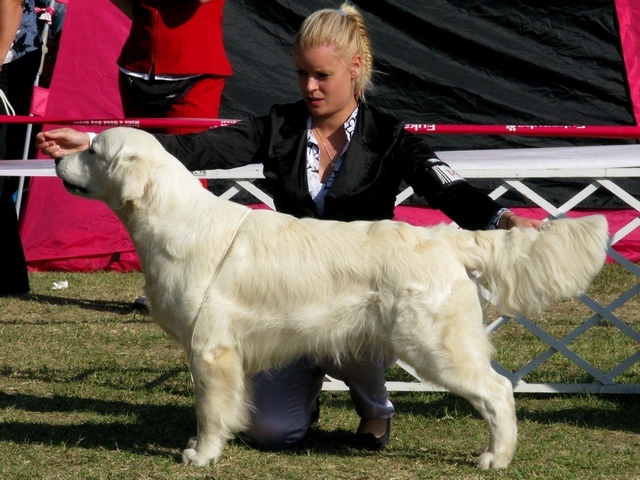 Thank you Bruno this is fantastic dog, and Adriana Németh the handling! Sorel: JCAC, Best Junior, BOB, Junior Best in Show, BOG and reserve Best in Show! at his age 10 month! He Became HUNGARIAN JUNIOR CHAMPION. Many thanks to Adriána Németh, Sorel beautiful presentation.! Excluded from puppy Pearl of Golden-Hill Winter Fire "Gino"
Thank you Adrian Nemeth of your help! 24.06.2011. Nina HD, ED pre-scanning. If you want a healthy, beautiful puppies do not hesitate to contact us search.